It’s easy to get stuck in a rut. What binds the characters in Two Steps Forward is an indomitable desire to climb their way out. Located in familiar Australian settings, this collection of stories brilliantly weaves together authentic characters and adverse scenarios. You’ll encounter battlers, underdogs and people who are doing it tough. Folks to applaud and causes to cheer. 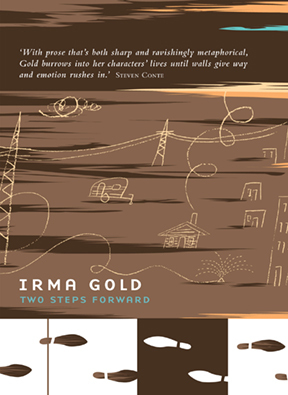 In this moving, assured debut, Irma Gold celebrates courage and challenges our notions of what it takes to be happy. Two Steps Forward is the final collection in the Long Story Shorts series. Shortlisted for SPUNC’s inaugural Most Underrated Book Award (MUBA). The winner will be announced on November 8 2012.